Red River College offers two mobile training labs (MTLs) to support the delivery of quality trades training and classroom-based training to rural and northern Manitoba communities. Each unit consists of a 53-foot trailer with slide-out sides that quickly transform into 950 square feet of vocational training space. 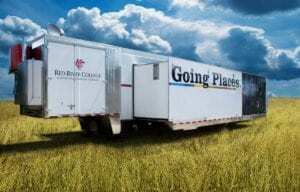 Supply trailers can connect to the mobile training lab, increasing total facility space to almost 2,000 square feet to facilitate training to a maximum of 12 students. The portability of the training labs allows RRC to deliver nationally-recognized trades training such as automotive, carpentry, electrical, machining, pipe fitting, plumbing, welding and industrial mechanics, based on the training needs of the organization or community. In addition, the MTLs can be utilized for classroom-based training, including full-time programs and corporate training. Each year the College uses the MTLs to support the community-based delivery of two five-month Introduction to Trades programs for rural and Indigenous learners. The MTLs are also available for Try-a-Trade school events, where the MTL is displayed with hands-on trades activities to allow participants to experience welding, carpentry and electrical demonstrations. Try-a-Trade events provide K-12 students with hands-on experience using tools and materials in the mobile training lab under the guidance and supervision of a qualified RRC trades instructor. The MTLs increase access for students in rural areas and link training with community-based projects and emerging industry needs. Community-based programs enhance student success because students are able to remain in their home communities to complete studies and maintain access to family and community supports. At the same time, this builds the labour-pool capacity within the rural and Indigenous communities. Red River College brings growth, inclusion, continued Indigenous outreach, accessibility and quality innovation with our mobile training labs. The logistics coordinator will travel to the potential site location by service truck to meet with the community/industry contact person and to conduct the site assessment. Additional visits may be required for delivery of additional supplies or equipment for the program and/or MTL. Are the road conditions suitable, and are special permits required? Please note that due to trailer configurations, the Mobile Training Labs are not able to travel on Manitoba’s winter road system (ice roads). Is the site location suitable for the amount of space required for the MTL & Supply trailer? Is the site level, and capable of supporting the weight of the MTL & Supply trailer? If there is no cell service for the MTL security system, is there a local security company available to monitor the MTLs? (Weekends, evenings, and any time the MTLs are not in use while on site). Is there fuel delivery service available in the community? Is there access to a classroom for theory, as well as access to washroom facilities? Access to single-phase or three-phase power is normally used to run the MTL lab, equipment and trades tools (depending on the type of training), and helps to keep the costs down when utilizing the training lab within remote communities. If the necessary hydro hook-ups are not available, the MTL can operate using the internal generator. The generator requires regular fuel top-ups, which may also involve additional fuel delivery costs from an out-of-town vendor, depending on the location of the training. Costs for deployment/use of the Mobile Training Labs vary considerably, depending on the location and duration of the training, available hydro hook-up, security costs and seasonal costs (i.e. winter heating and snow-removal costs). Program delivery costs also vary depending on the type of program that is being delivered and the types of equipment and supplies that will be required to support the program (i.e. construction materials for a carpentry program, welding equipment and gases, etc.). Community-based MTL deployment and training cost estimates are available upon request.